The cross-party Campaign for Clean Air in London (CCAL) congratulates Parliament’s powerful Environmental Audit Committee (EAC) again on the rapid progress of its hard hitting and effective inquiry into whether the UK has an effective strategy to comply with its air quality obligations. It is clear today the UK does not have such a strategy. Robert Vaughan, National and Local Air Quality Strategy, Department for Environment Food and Rural Affairs. Questions on the health impact of poor air quality begin at 19 minutes, 25 seconds. “Why has it taken direct questioning by the Environmental Audit Committee (EAC) to get a government Minister to refer, for the very first time, to the possibility of 35,000 premature deaths in the UK in a year due to air pollution? “The highest government number we have heard before was ‘up to 24,000 deaths per year (nine times more than traffic fatalities)’ when the same Minister gave a speech on 17 September 2009. 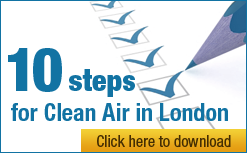 A Freedom of Information request by the Campaign for Clean Air in London confirmed the ‘up to 24,000’ number used in the speech last year was based on 1998 estimates for the health impact of air pollution (which themselves comprised 8,100 premature deaths due to short-term exposure to dangerous airborne particles; 3,500 due to sulphur dioxide; and between 700 and 12,500 due to ozone). It is clear the government knew as early as 2001 that long-term exposure to dangerous airborne particles was responsible for many times more premature deaths than short- term exposure. “Under intense questioning as part of the same EAC inquiry two weeks ago, Professor Frank Kelly – one of the UK’s most respected health experts – confirmed the likelihood of around 35,000 premature deaths in the UK in 2005 due to long-term exposure to dangerous airborne particles. Professor Kelly mentioned also a European estimate of some 50,000 for such deaths for the UK. Even allowing for some overlap between the number of premature deaths due to short-term and long-term exposure, and perhaps between different types of pollutants, the EAC has finally unearthed the real impact of poor air quality in the UK. The House of Commons Environmental Audit Committee (EAC) announced on 21 October 2009 its inquiry into Air Quality. The purpose of the inquiry is to assess whether the government is developing an effective strategy for meeting its obligations under the EU Air Quality Directives.